the contest and the weather couldn’t have been better! Clear skies, light winds … the pilots were getting fired up to compete for the first place prize of $20,000! However, with Hurricane Isaac moving up the Gulf Coast and predicted to head straight toward Tennessee, the 2012 Clover Creek Invitational did not look too promising to take place over Labor Day weekend. It wasn’t until Wednesday afternoon when weather forecasters had predicted the worse -- 40% chance of rain on the opening day of the contest, and then a wash out for the remainder of the event! With only a few hours remaining until the pilots meeting, the event staff had a brief chat and quickly decided to change the schedule of events for Thursday. At the pilots meeting we announced these changes and all 16 pilots were receptive to the change and received instructions to be at the flying field and ready to fly at 7:00am! We concluded the pilots meeting by drawing for flight order and then handed out Unknown ‘A’. tirelessly and poured every ounce of energy into their flying as it could have been the only day we had to fly! Everybody packed up and was ready to call it a night, leaving with a predicted weather forecast for Friday of 70% chance of rain. With 96 flights flown Thursday, we had planned to fly the remainder of the weekend as originally scheduled. Friday consisted of flying Unknown ‘B’, Known ‘B’single sequence, Freestyle #2, and another round of Known ‘B’ single sequence. Believe it or not, we were able to get all scheduled flying in not only on Friday, but Saturday as well! them to pick out several prizes that were graciously donated by some of our sponsors. He then went on to thank all of the event staff as well as the judges. But the primary reason of the banquet was to announce the top 10 finalist that would go on to compete on Sunday, the final day of competition. noted that he finished with a perfect raw score and was over 500 points in front of second place! It was safe to say that Gernot had come well prepared for this event. The top ten pilots to move forward were Gernot Bruckmann, Jason Shulman, David Moser, Nicolas Pinzon, Kurt Koelling, Frank Noll Jr., Nicolas Detry, Gabriel Altuz Jr., Matthew Stringer, and Will Berninger. On Sunday, the finalist started with a clean slate and a new contest in itself. They flew 2 single sequence rounds of Known ‘C’, Unknown ‘D’ and ‘E’, as well as 2 Freestyles. Each pilot kept his best score in each category to determine the winner. Should there have been a tie on the final day, we would have gone back to final standings on Saturday to determine the winner. 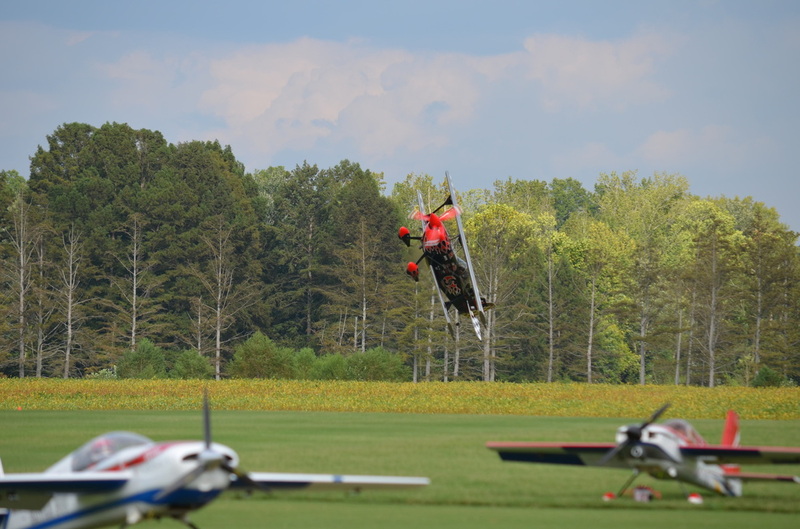 pushed the envelope as well, crashing his freestyle plane in the bean field during his last flight of the day. Fortunately his aircraft suffered minor damage and will be able to fly again. Gernot Bruckmann had flown some very well choreographed freestyle routines and was on mark as usual. Gabriel Altuz was the last pilot to fly Freestyle and he put on a show that will always be remembered as well as allowing him to win that round of Freestyle! pulled off the win with only 29 points in front of second place! David Moser came in second followed by Kurt Koelling, Nicolas Pinzon, Jason Shulman, Gabriel Altuz, Matthew Stringer, Will Berninger, Nicolas Detry and Frank Noll. The 2012 Clover Creek Invitational was another success! Debuting in 2008, Clover Creek is now known worldwide! We can boldly make that claim as we had judges and pilots attend from The Netherlands, Norway, Canada, France, Italy, Austria, Puerto Rico, Australia and all across the United States! Thank you to all that had attended and made this event what is was and what it will be in the future!